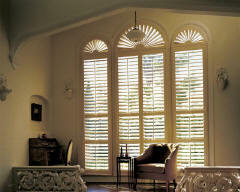 More than a classic look that never goes out of style, Hunter Douglas custom shutters provide superior sun protection, light control and privacy. Available in premium hardwood and poly-satin, faux wood compounds. Heritance® hardwood shutters are crafted for maximum strength and durability using Truemill® dovetail joinery and finished with any of our 100 Integra paint and stain finishes. 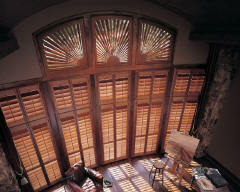 Our innovative NewStyle® hybrid shutters combine the great style of wood with the strength, stability, and straightness of advanced modern-day materials. Constructed from UV resistant polysatin compounds, Palm Beach™ Polysatin™ shutters are guaranteed never to warp, fade, chip, or peel, regardless of extreme heat or moist conditions.